This Shamrock Shake is a McDonald’s Copycat recipe that tastes just like the real thing! A thick and sweet vanilla mint shake for St. Patrick’s Day! 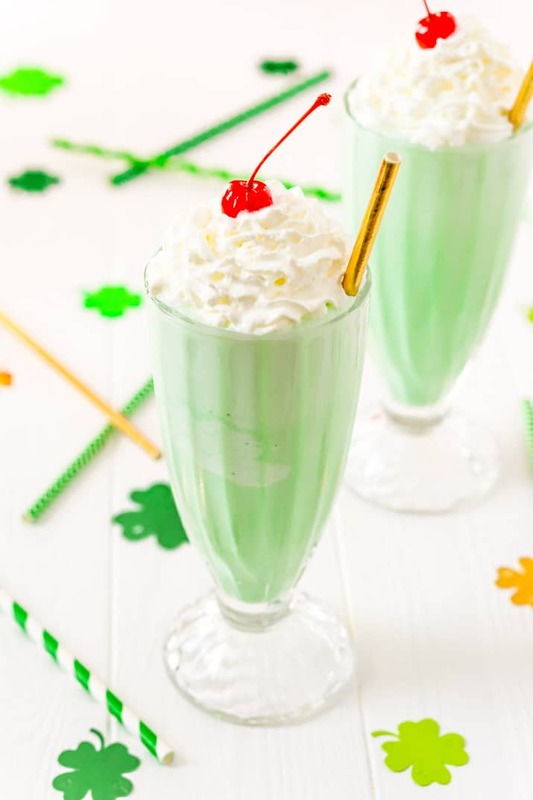 This Shamrock Shake recipe is a fun way to celebrate St. Patrick’s Day! You know, I’ve never been a huge fan of McDonald’s food (except the hashbrowns – oh man, those are good) and I was ready to write them off forever after the discontinued orange Hi-C last summer. But there’s still one thing I can’t resist – the shakes! I mean, they really are the best, thick and creamy and just sweet enough! Who could resist one of those delicious shakes topped with whipped cream and a maraschino cherry? At least once I month I have to swing through the drive-thru to get one and I’m always excited for this time of year to roll around because it means the Shamrock Shake is back in town! I used to look forward to this time of year when I was a kid because I loved these green shakes. It was like they took my favorite vanilla shake and added a splash of sweet mint. 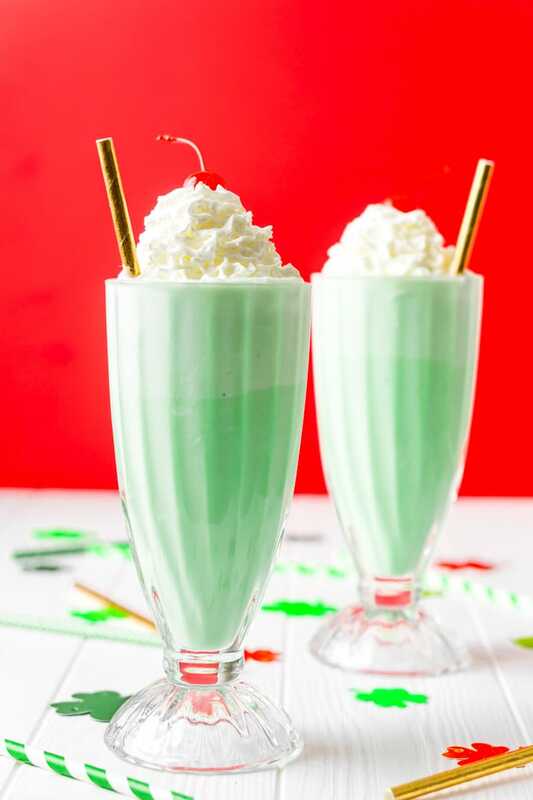 It’s a sweet mint flavored shake, not peppermint, and it’s made with vanilla ice cream to give it a little extra sweetness. What’s In A Shamrock Shake? 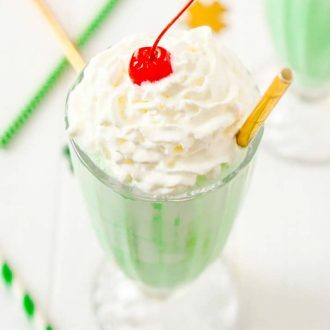 This recipe is made with vanilla ice cream, whole milk, mint extract, green food coloring, whipped cream, and a maraschino cherry. Milkshakes are very easy to make at home, all you need to do it add ice cream, milk, mint extract, and food coloring in a blender and blend until combined. Pour into two glasses and top with whipped cream and cherries. Alcoholic: Swap out your milk with Bailey’s for a boozy take on this milkshake! Chocolate: Do you love chocolate and mint together? Simply swap out vanilla ice cream for chocolate! You can leave out the green food coloring if you do this. Pin this Milkshake Recipe for Later! 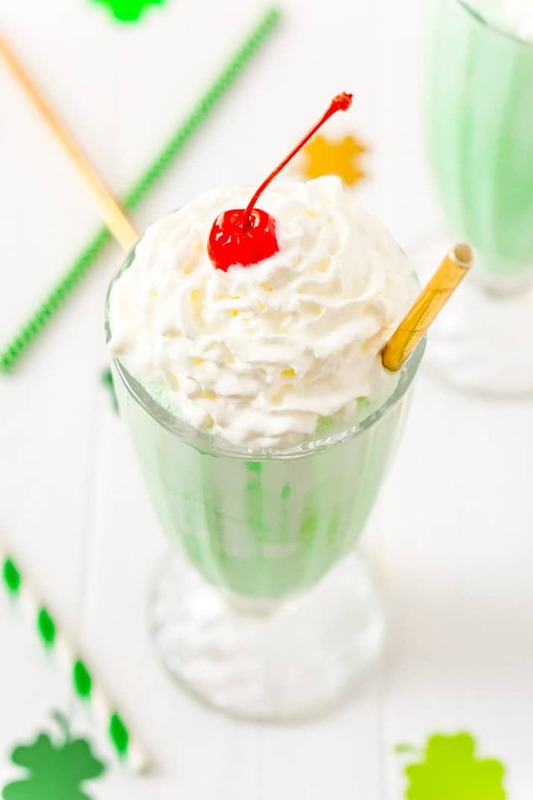 This Shamrock Shake is a McDonald's Copycat recipe that tastes just like the real thing! A thick and sweet vanilla mint shake for St. Patrick's Day! Add ice cream, milk, mint extract, and food coloring in a blender and blend until combined. Pour into two glasses and top with whipped cream and cherries. Milkshakes are one of my favorite guilty pleasures…and this will save me SO much money being able to make this delicious one at home rather than driving through all the time for one! Thank you!! 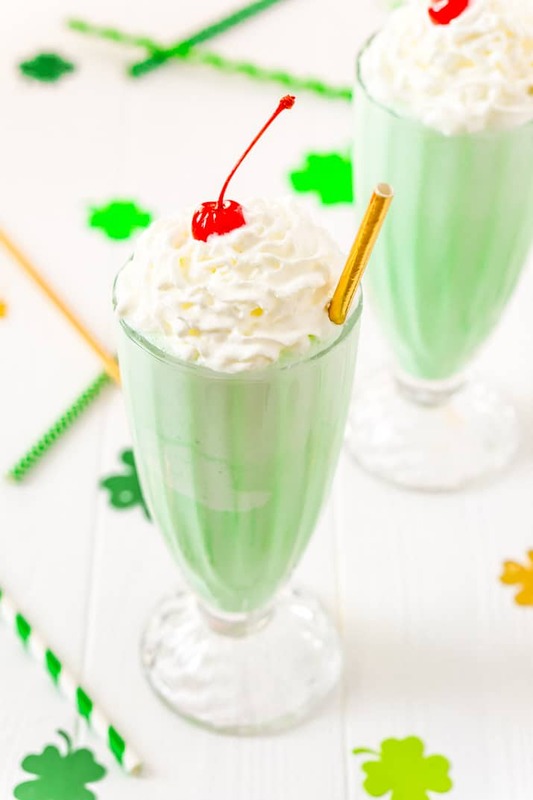 I definitely love a good copycat recipe and the shamrock shake is so delicious!